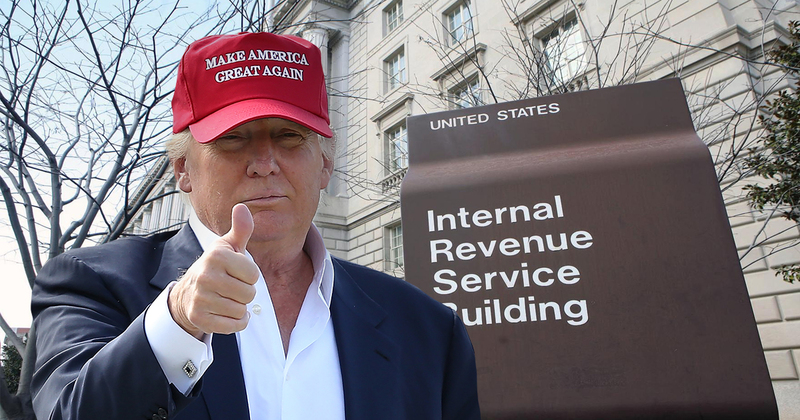 If elected President, Donald Trump pledged today he’ll transform the IRS Bureau of Taxpayer Compliance into a new Bureau of Taxpayer Assistance that will help individuals and small businesses avoid paying federal taxes. The new Bureau would provide information to ordinary taxpayers enabling them to use the same tax-avoidance loopholes and subterfuges that Mr. Trump has employed with remarkable success for decades. Trump trumpeted his pledge at a boisterous campaign rally in Witches’ Brew, Wisconsin. The happy crowd roared its agreement. At this, the crowd went bonkers. Hundreds of Make America Great Againbaseball caps went flying into the air. Several old white men in the crowd fainted, apparently from a surfeit of pleasure. At least a dozen obese women tearfully promised each other they’d go on a diet. However, as soon as Trump’s pledge was broadcast it came under fierce attack from the nation’s financial sector. Caldwell B. Cladwell, President and CEO of The 1% Club, an organization which consists exclusively of billionaires, appeared on Fox News, sputtering with rage.